Living gifts are wonderful for any holiday, and they are particularly popular in winter when they bring a lovely touch of nature indoors for us to enjoy until spring. 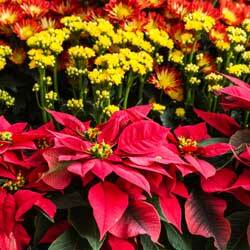 Fortunately, there are many popular plants that make stunning holiday gifts. Available in shades of white, pink, red, gold, plum and variegated combinations, poinsettias are great for decorating your home as well as the perfect holiday gift. We sleeve your plants to protect them as you take them to your car. Do not leave these plants in an unheated car, and take them indoors quickly when you get home. Poinsettias’ colorful bracts last well beyond all the holidays and even into the spring if properly cared for. These easy-care plants prefer bright, filtered light in a spot free from drafts. Let the plant become moderately dry between waterings, and don’t fertilize while in bloom. Ask for our re-blooming guide if you want to try your hand at re-flowering your poinsettia next year. With colorful flowers in red, pink, salmon, orange, lavender or white, Christmas cactus will do best in a sunny south, east or west window. Keep the soil evenly moist but not too wet or else the roots may rot. To encourage your cactus to bloom, avoid any artificial light at night starting in September. You will also need to keep the plant in a cool location, allow the soil to dry well between waterings and don’t fertilize. Over time, these plants can grow to tremendous proportions and will have dozens of blooms just when their colors are most welcome. 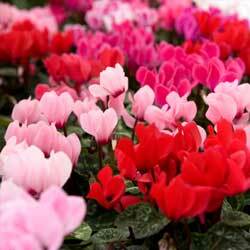 Cyclamen is a popular perennial plant with generous colorful flowers that bloom for a long time. Keep cyclamen evenly moist from September through May. Let them dry from June to August so the tuber can rest. Ideal light is a sunny east or west window, but do not allow the foliage to touch the glass or it may freeze or burn with the temperature changes. Cyclamen prefer a cool room (60-70 degrees). Feed them from September to May, then stop for the summer months to encourage winter blooming. This plant never fails to break the gloom of winter and provides enormous pleasure with its large, gorgeous blooms. If you want an amaryllis to bloom for Christmas, it must be started in the fall. Plant your amaryllis in a container not much larger than the bulb itself with a third of the bulb above the soil. Place in a warm, sunny spot, watering when the soil is dry. As the bulb grows more actively, increase the frequency of watering. Your plant will flower in brilliant red, white or a variegated pattern of the two. After flowering, you can save the bulb for next year. Ask one of our staff for instructions or pick up our free guide about amaryllis. Florist azaleas normally bloom in spring, but they can be forced into bloom anytime. Azaleas are available in many colors, with the most popular shades including pink, white and peach. These flowers come in both single and double blooms and they can last for up to a month, ideal for a holiday gift or winter decoration. When an azalea is blooming, do not allow it to dry completely. These little trees are native to Norfolk Island in the Pacific, where they will grow as high as 200 feet with trunks 10 feet in diameter. Smaller versions are easy-to-please houseplants. A slow grower, Norfolk Island Pines will send out about 6 inches of new growth each year. Bright, indirect light is fine although in the winter the plants can stand full sun. Keep the plant moist, but never sodden. Feed your plant every 2 months. Repotting is best done in spring but needs to be done infrequently, since the plants are slow growers. These trees lose their lower branches as they grow. 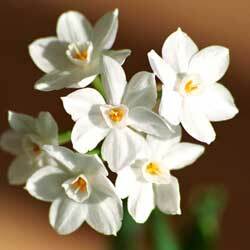 Of all flower bulbs, paperwhite narcissus are one of the easiest to bring into flower in the indoor garden. Paperwhites are the delicate white flowering, notoriously fragrant narcissus that reliably bloom indoors about 4-6 weeks after planting. Paperwhites are grown in a dish with stones (or in a pot with soil). Fill the dish halfway with stones and place bulbs on top. Place bulbs close together, but not touching. Add water up to the base of the bulbs. Pack more stones around the bulbs until just the tips of the bulbs are visible. Place in a bright, cool area (60-65¡ F) and water regularly. No matter which plant you choose, these gifts from the greenhouse add a fresh touch to any home throughout the winter.